Over the past 10 years, I have struggled more and more with my vision. I have worn glasses or contact lenses since I was 16, but presbyopia has settled in. My eyes have lost their zoom lens. 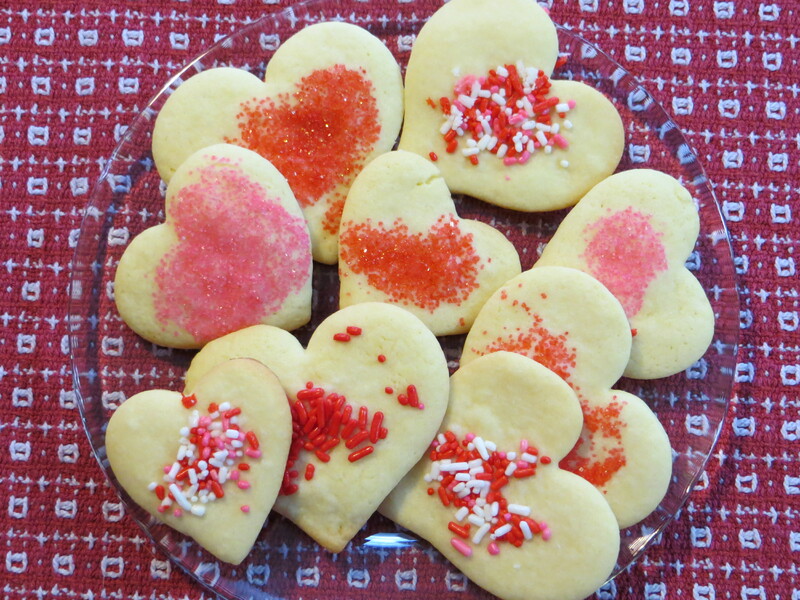 My indoor interests–reading, sewing, cooking–all require close work, which makes this loss of autofocus frustrating. I have tried a number of aids with varying degrees of success. A couple of years after I got my bifocals, I had my old frames remade into reading glasses with just my bifocal prescription in the lens. These glasses are helpful when I am doing extended close work. Proper illumination is key. I have had this old architect lamp attached to my sewing table for years. I love how I can adjust its height and direct the lamp wherever I need it, it swivels at the base, and the circular fluorescent ring and the center incandescent bulb provide nice strong light that keeps colors true. When the center bulb dies, I’ll replace it with an LED bulb. 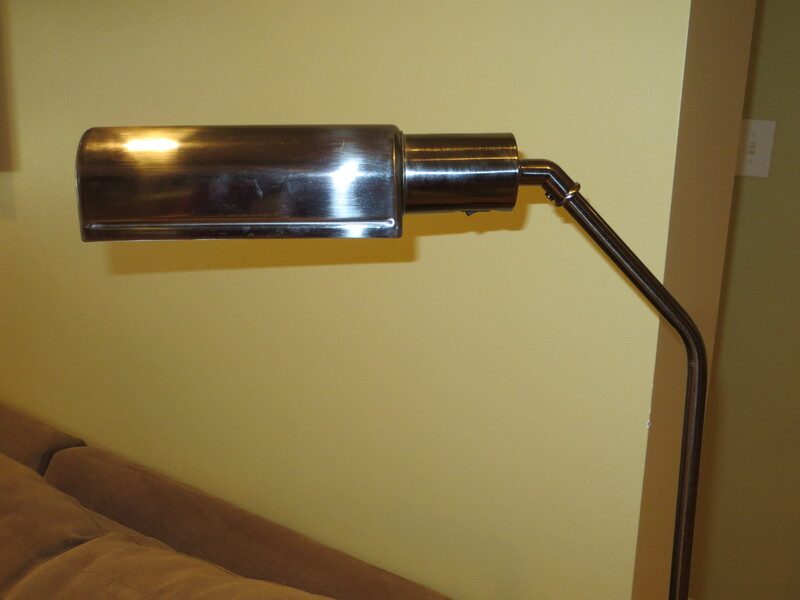 When I looked for it online, the lamp that looked most similar is the Ledu swing-arm clamp lamp. This Ott floor lamp in the family room is great when I want to do close work while hanging out in front of the TV. It swivels and provides a bright concentrated source of light. 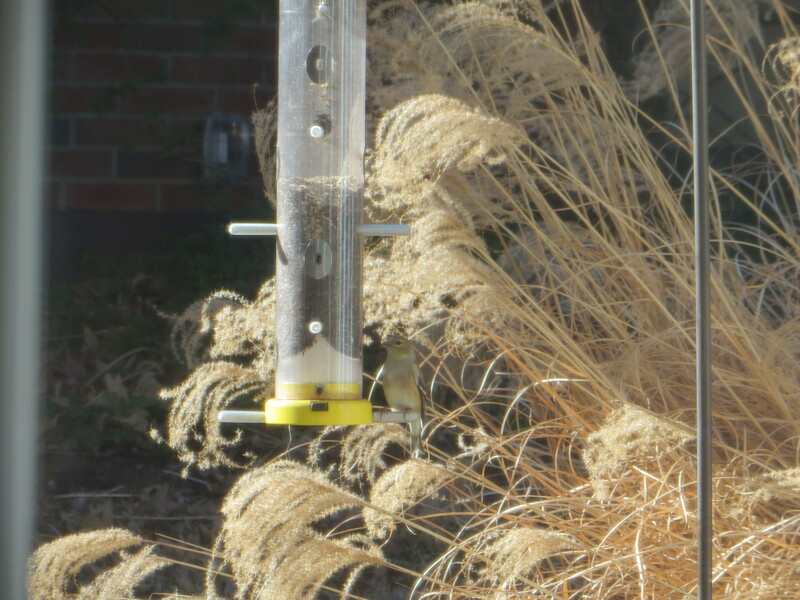 I found it on sale many years ago at Home Depot. It takes only special Ott bulbs, so when the bulb dies, don’t throw it away–take it with you to help you find the correct replacement. I bought this little guy a few years ago at a local fabric store, but it is also available on Amazon. 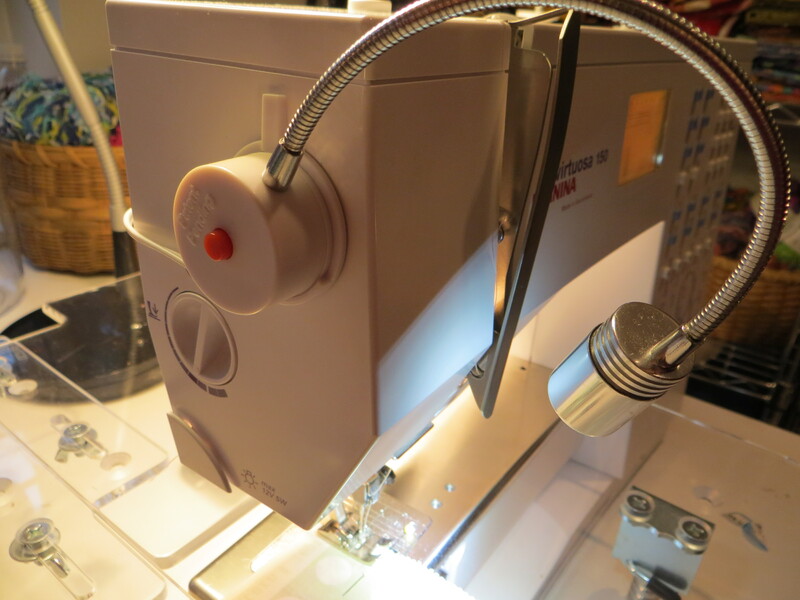 It mounts on the sewing machine and plugs in–no batteries. It offers a bright LED light that I can point right where I need it–at the needle and presser foot. The lightbulb on the sewing machine has never provided enough light for me. My newest light was my Christmas gift from my family (again, it can be found on Amazon). 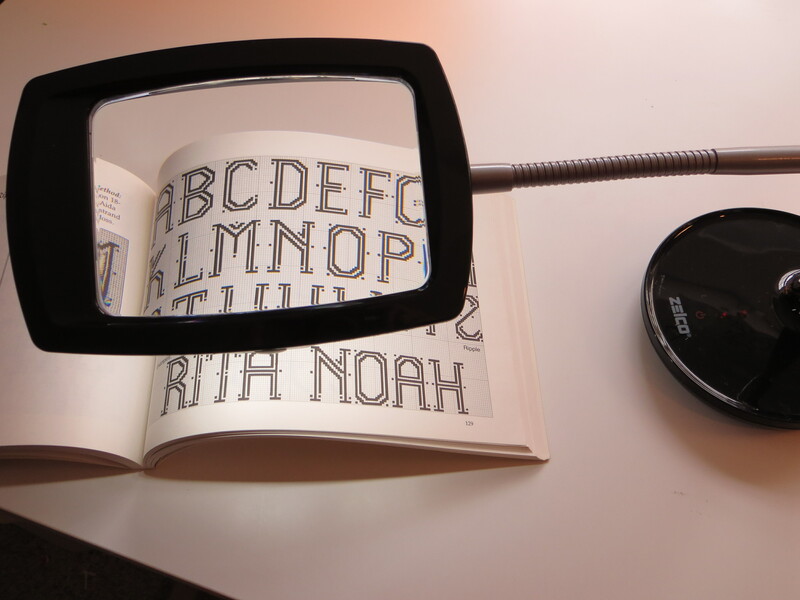 It combines both the magnification I need and strong LED light–it is awesome! The flexible gooseneck is adjustable and there are three settings of increasing light. 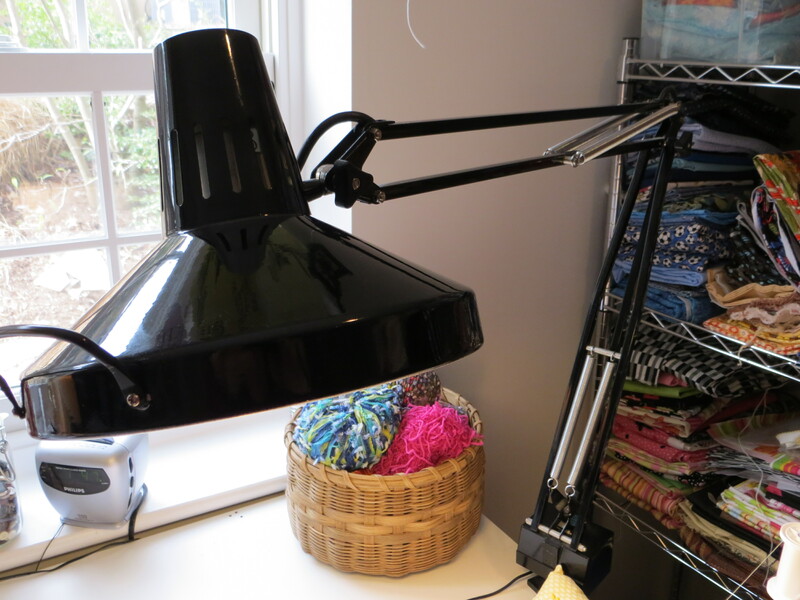 I have found this light handy when I am transferring needlepoint designs or doing embroidery at my sewing table. This magnifier bar is a low-tech solution that I picked up at Barnes & Noble, and it is surprisingly helpful. 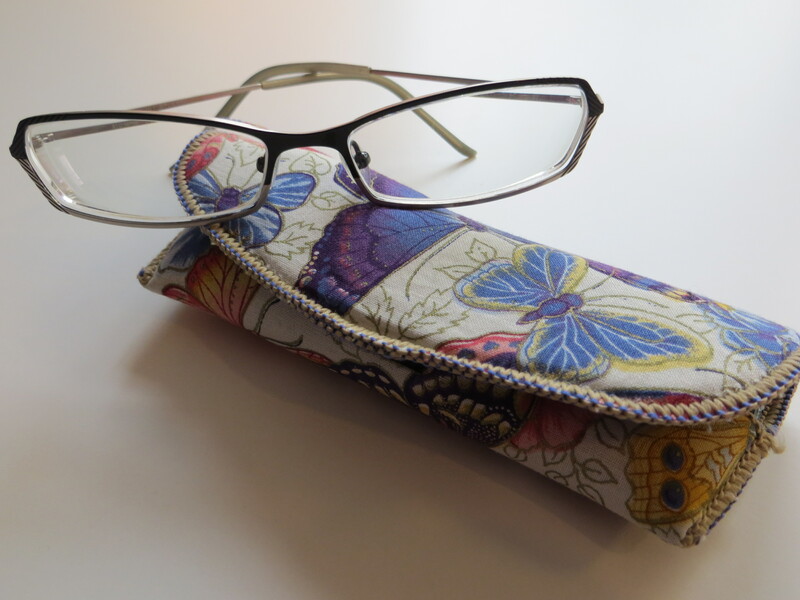 I use it most when reading the newspaper or cookbooks (although here it is with my current sewing project). Truly, however, what I have found most valuable is having my sewing table positioned so that when I look up, I look out a window and my eyes are forced to adjust to distance vision. 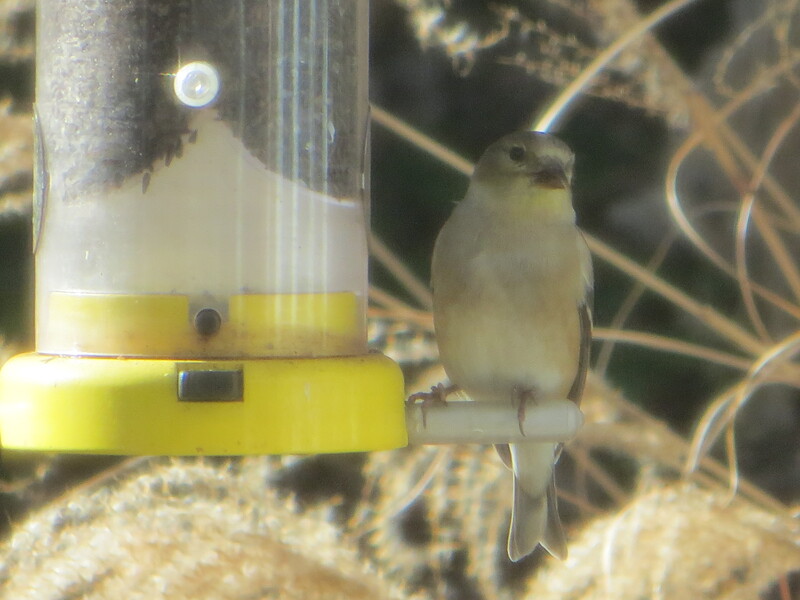 I have a yellow finch feeder outside the window, and it is lovely to look out and see finches and juncos flitting around. I get a healthy dose of nature and my aging eyes are made to stretch their muscles from close to far. Such charming fellows can be distracting, however! Daughter #2 and I have often found that mistakes inspire improved design. This keychain was made for a long-time soccer teammate/fellow band-geek friend of Daughter #2’s. Her family is from Australia (which is where she was born), and she now lives in the United States. We thought working the Australian flag on her keychain would be perfect, especially after our success with MK’s Union Jack keychain. 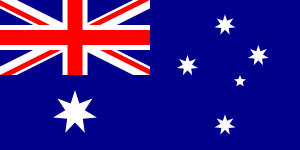 However, despite many tries, we could not get the mini–Union Jack that appears in the flag’s upper left quadrant to work–the diagonals on this small scale were a killer and our attempts looked plain goofy. We carefully seam-ripped it out and considered other options. We finally settled on doing her initials in red and white in the upper left quadrant, which suggest the Union Jack, and keeping representations of the Commonwealth Star (in the lower left quadrant) and the Southern Cross constellation. We like how the design ended up as a personalized mash-up of the US and Australian flags–just right for Danielle. For another special friend, Daughter #2 and I came up with a modern aqua/coral palette and chose a font and layout that emphasized the serifs and descenders. 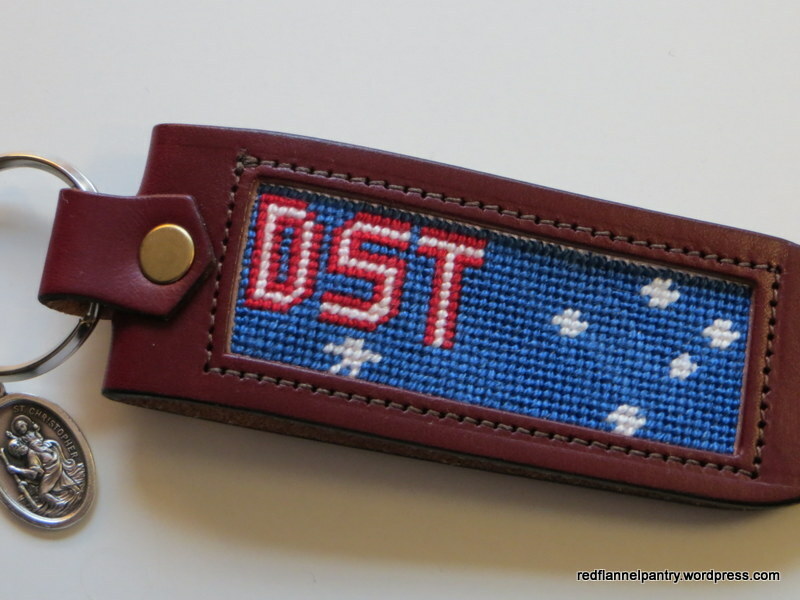 After D#2 needlepointed the name though, we realized the design was skewed to the right (rather than centered as intended) and there was too much empty space beneath the name. Hmm. 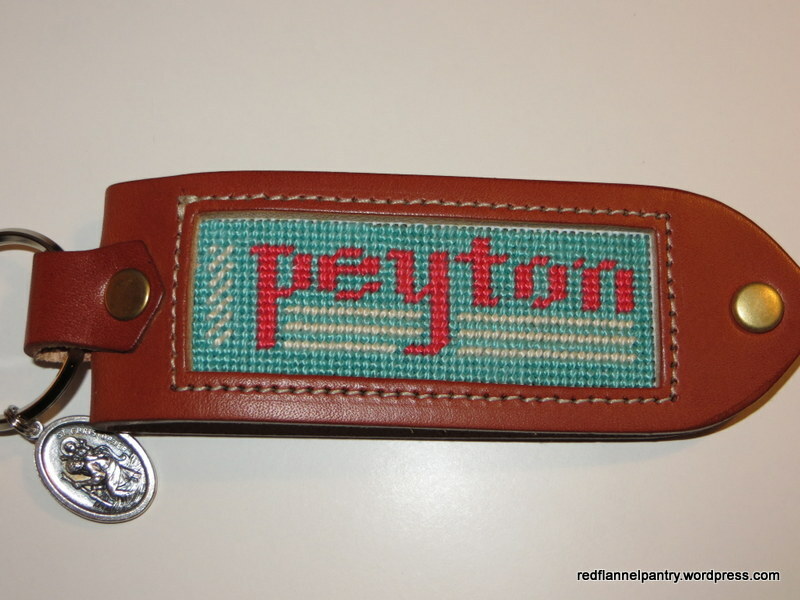 . . .so for balance and fill, using ecru floss, we added rules beneath the name and a geometric pattern to the left. In the end, it looks better than if we had finished it as intended. Happy Birthday, Danielle and Peyton! My friend, Lynn, recently asked me if I could make a terrycloth dishtowel apron for her mother-in-law, aka Bubbie or Mrs. T. I didn’t know what she meant at first, so to Google images I went. Oh, the pictures brought back memories and I knew exactly what Lynn was describing! 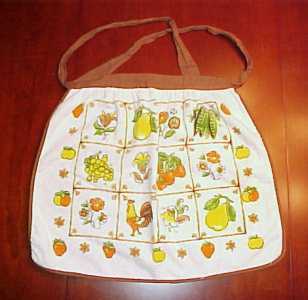 If you are over 50, you will remember these aprons worn by our mothers and grandmothers. 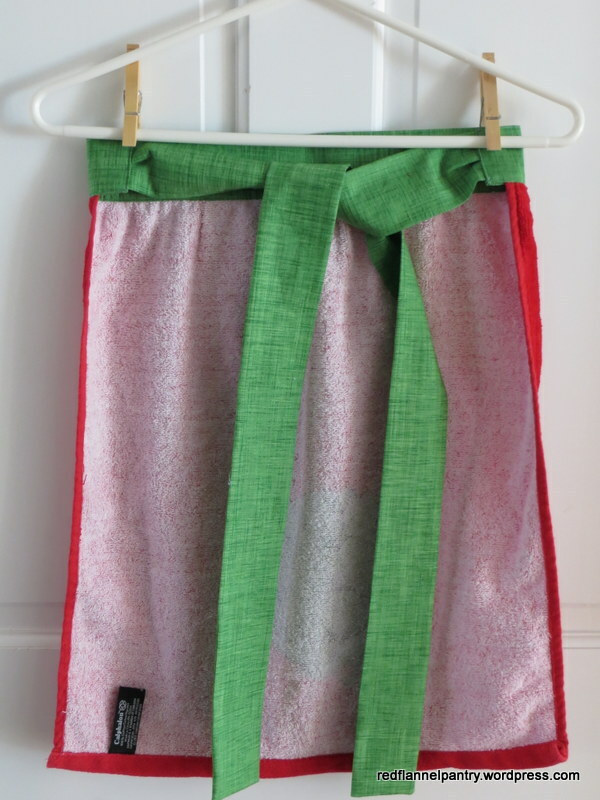 In the 1950s and 1960s, resourceful, creative women would take a terrycloth dishtowel and add a waistband, ties, and binding to make an apron. It was a practical way to wear art that you could wipe your hands on! I searched online for instructions to make one, and although there are loads of creative apron tutorials, I couldn’t find one to make an apron exactly like Mrs. T wanted. So I made one up. 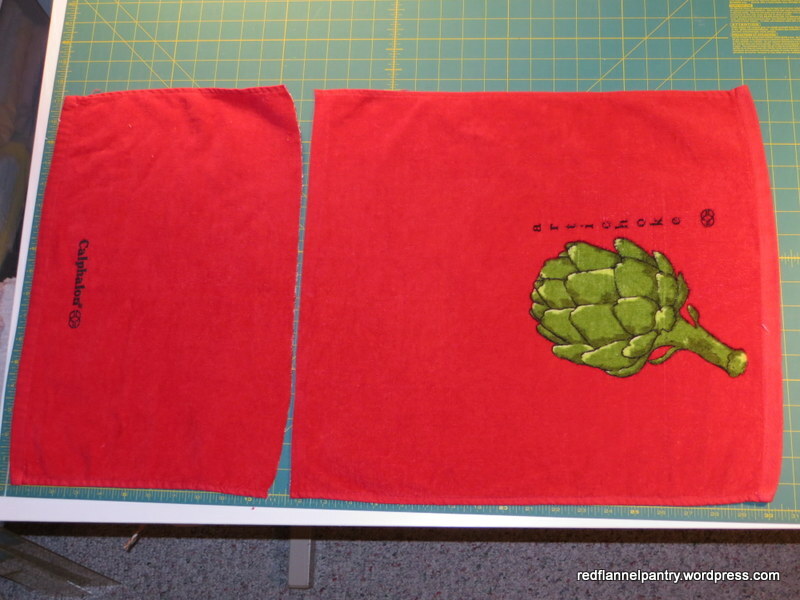 Here’s my take on making a terrycloth dishtowel apron. Materials: terrycloth dishtowel, approx 16″ wide x at least 20″ long; coordinating fabric, one piece cut to 5″x17″ (for waistband) and two strips cut to 5″ x 28″ (for ties); and iron-on interfacing (two pieces cut to 2″ x 16″). First, find a plush terrycloth dishtowel–not an easy task. 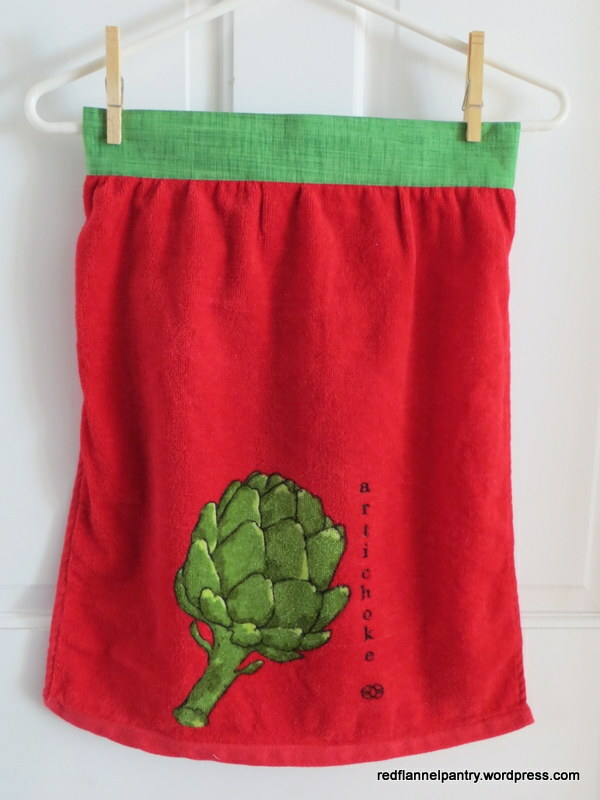 You could use a regular linen-type dishtowel, but Mrs. T wanted one that you could really dry your hands on–only terrycloth would do (and I agree!). The best ones I came across were at Bed Bath & Beyond and made by Calphalon–they are reminiscent of the vintage Vera Neumann dishtowels with their bright artsy renderings of fruits and vegetables. 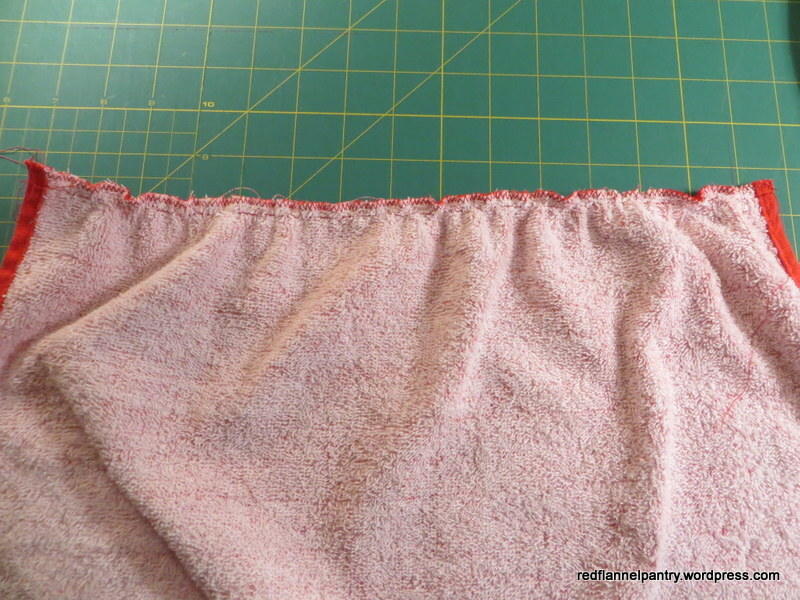 Fold the waistband in half over the top to the front, covering the seam beneath. The waistband width will measure 2 inches finished. Iron, pin and top-stitch the bottom edge of the waistband in place. 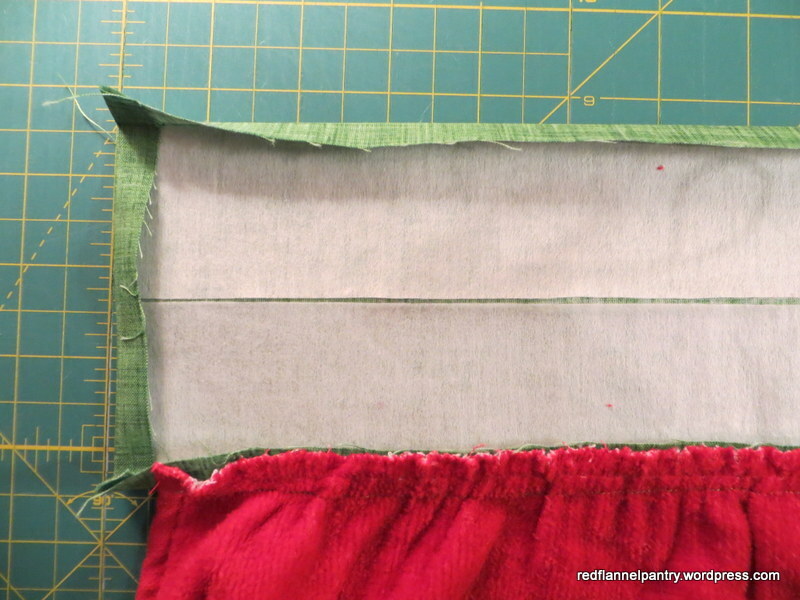 Leave the sides of the waistband open. 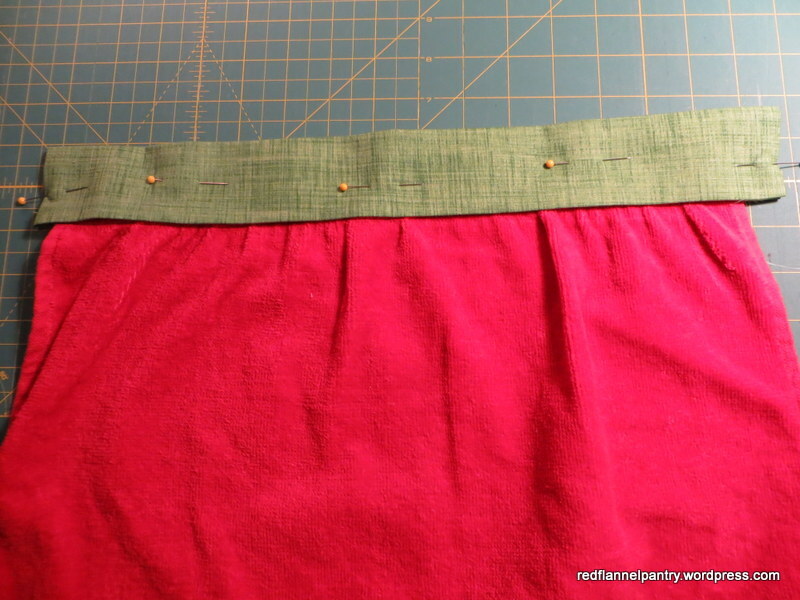 The sides of the waistband will extend about 1/2″ beyond the apron on both sides. 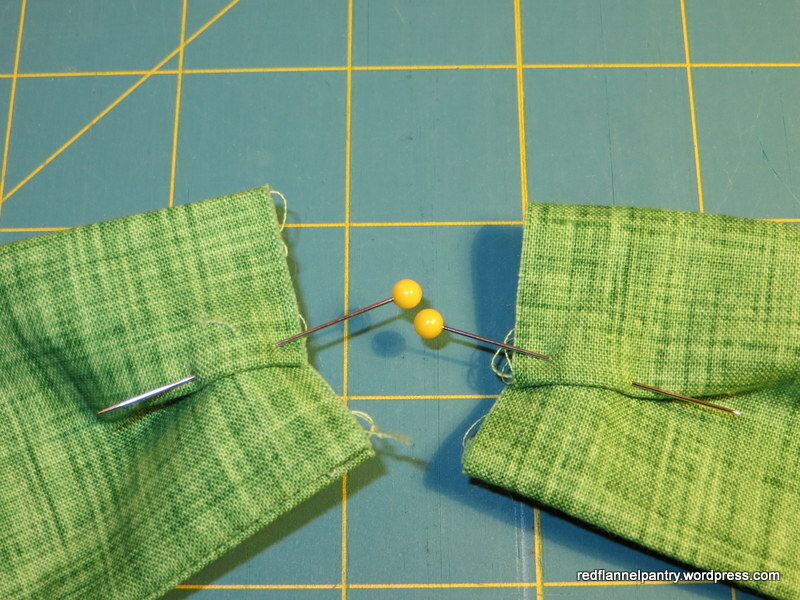 For the ties, fold each 5″ x 28″ piece of fabric in half lengthwise right sides together. 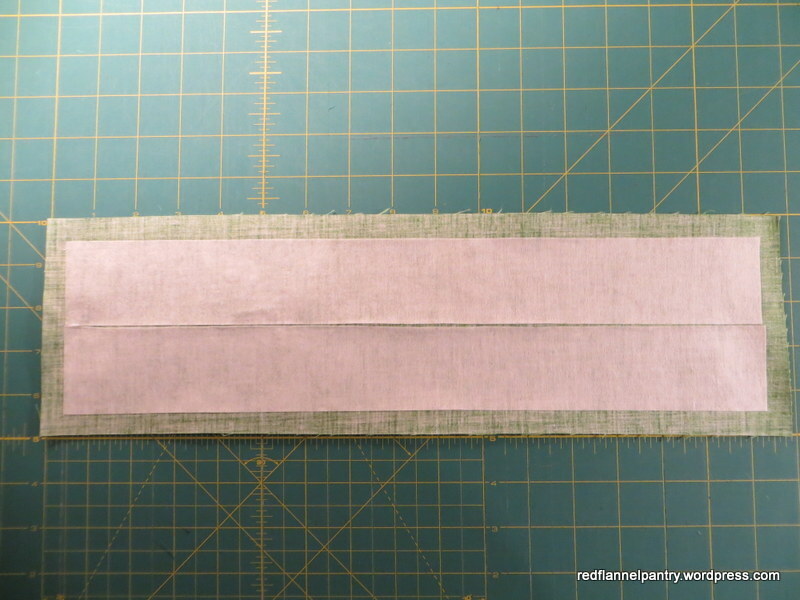 Using a 1/4″ seam, sew along one short end and then the long edge. Leave the other short end open. Clip the corner and trim, turn inside out through the open end and press with an iron. 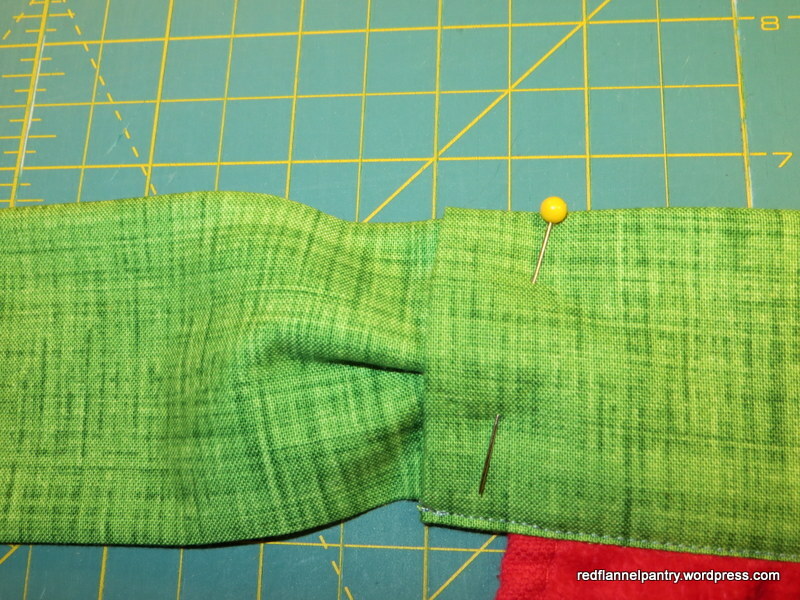 Fold the open end to create a small pleat. 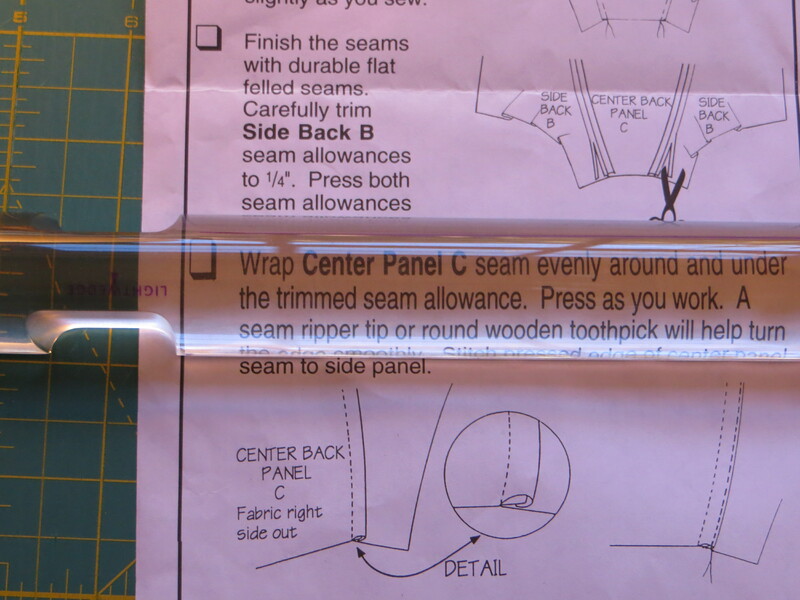 Insert this pleated tie end into the open end of the waistband. Pin in place, adjusting the pleat so the tie fills this open end smoothly. Top-stitch the seam shut, making sure to catch the back side of the waistband. 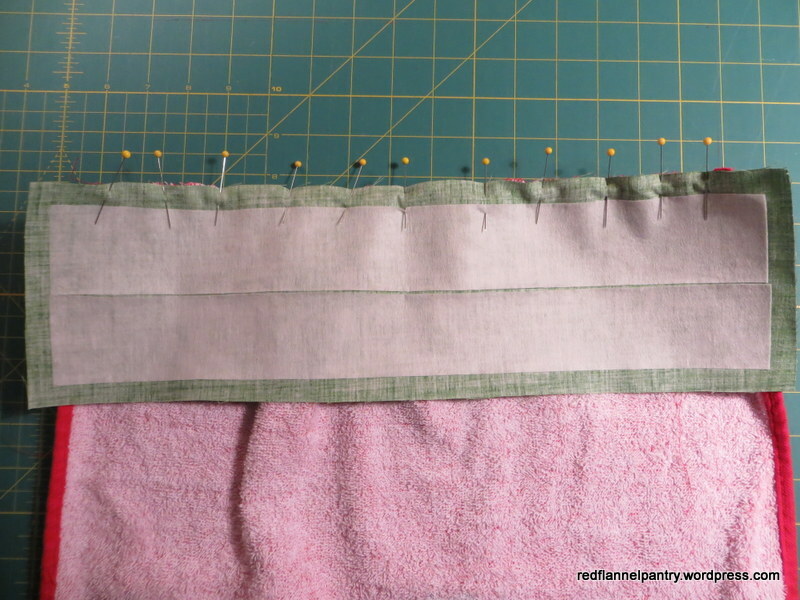 To finish, top-stitch the top edge of the waistband. 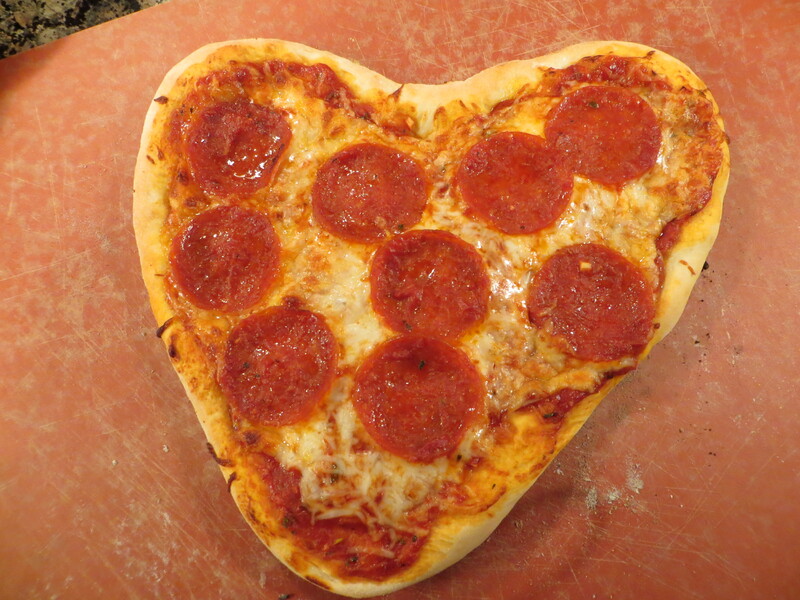 It is practical and cute–I hope Mrs. T loves it! If you’d like a pdf of these instructions, you can find it here. This weekend we all were busy making and creating. 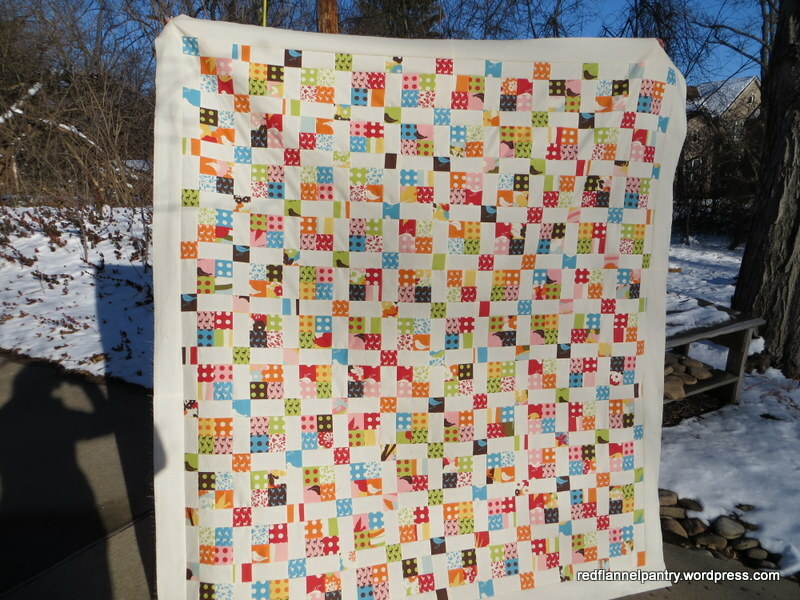 I finished piecing this quilt top using an Oh Deer by MoMo for Moda Fabrics jellyroll–on to the backing. 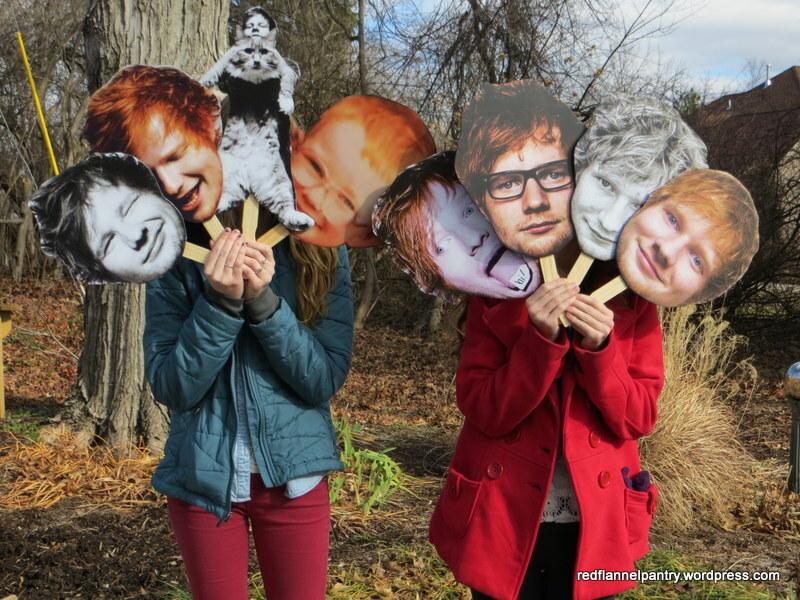 The father/daughter project was the creation of Ed Sheeran heads (x8) for the concert last night. Daughter #2 found various photos online, resized them in Photoshop, and emailed them to Dad to print out and bring home. The two of them then cut them out, used spray fixative to glue them to black foamcore, and cut them out using Exacto knives. Paint sticks were attached to the back for handles. She and her friends had fun waving the mini–Ed Sheeran talking heads during the concert, and each girl took one home as a post-concert momento. Time to watch the Superbowl!